In eukaryotic cells, genomic DNA is wrapped around histone octamers to form nucleosomes and further forms the higher order structure called chromatin. The chromatin fiber is then folded into distinct functional domains in the nucleus. This intricate structure is key to the regulation of gene expression, and changes in expression patterns during cell differentiation, development and disease. Exploring and understanding the basic mechanisms of chromatin domain formation and their re-establishment during cell and organismal propagation are of fundamental biomedical importance. 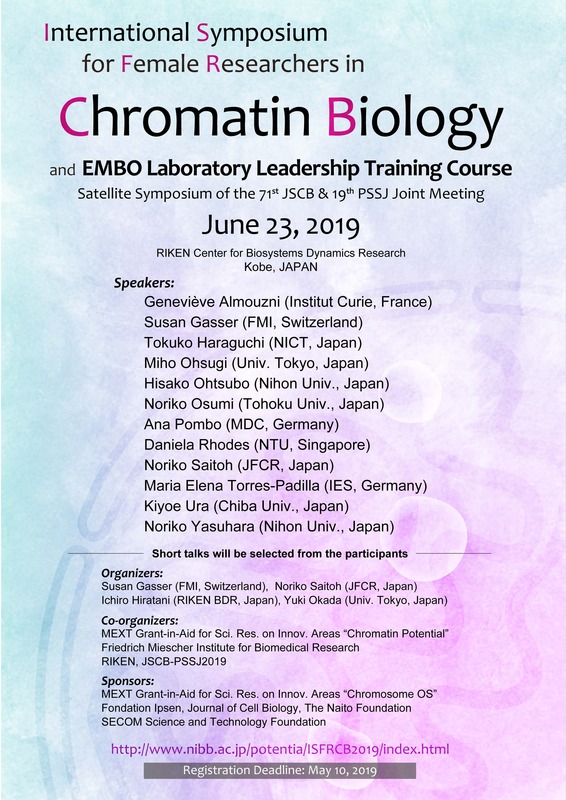 This symposium, a satellite symposium of the Japanese Society of Cell Biology and Protein Science Society of Japan Meeting also held in Kobe, will present the cutting edge of chromatin biology, by featuring leading women scientists in the field of chromatin biology. The morning session will include invited speakers from Europe and from Japan, including three institute heads from Europe. Recognized leaders from Japan are also invited to participate, in particular promising younger group leaders. Several speakers will be chosen from submitted abstracts. This symposium is open to all participants, men as well as women, although all speakers will be women. The goal is to compensate for the underrepresentation of women giving plenary talks at many conferences. Free lunch is provided for registered participants. In the afternoon, we will offer a leadership course, which is open to men and women, and will be based on the topics covered by the EMBO Laboratory Leadership Course regularly offered by the European Molecular Biology Organization in Heidelberg. The lab management course usually lasts 3 days costs EUR 2,600 (http://lab-management.embo.org/dates/ELL-GL-2019), so this session will rather be overview of themes that are important for successful scientific management (e.g., leadership, research integrity, problem solving, conflict resolution and mentoring). There will be smaller group discussions on specific topics that research team leaders encounter, led in part by the invited speakers from Europe, who will also help guide the discussions on institute and lab leadership in breakout sessions. Even though it will not replace a full EMBO Lab management course, we feel that it would be a valuable opportunity for participants to learn institute and laboratory management skills. We emphasize that both males and females are welcome to join both the symposium and the course. Participation fees will be applied (3,000 and 5,000 yen for the course and banquet, respectively). Morning seminar: for free, registration is required for lunch. EMBO COURSE: 3,000 yen, registration is REQUIRED. Banquet: 5,000 yen, registration is REQIRED. Program to be defined, but will include break-out sessions with female European institute heads to discuss challenges in leadership in science.